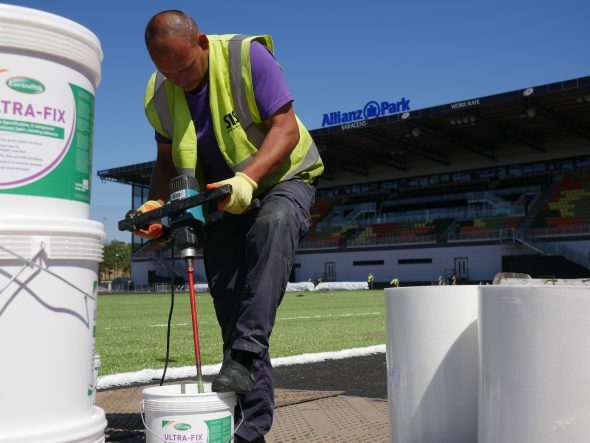 Envirostik products have assisted in an artificial pitch upgrade at Allianz Park, home ground of rugby union Premiership side Saracens. The upgraded pitch, installed by SIS UK Ltd., features a new larger-sized recycled infill, designed to help improve drainage with less compaction, a combination which is especially suitable for playing professional rugby, and it came into operational use for the start of the 2016/17 season. The Envirostik products used on the new pitch were Ultra Fix and RTX Tape. 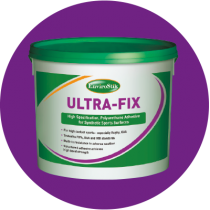 Ultra Fix is a two-part polyurethane adhesive designed for bonding seams of artificial grass carpets for synthetic sports pitches. It is especially suitable for high contact sports such as rugby. RTX Seaming Tape is a polyester tape for seam jointing of artificial grass and synthetic pitch carpets. It meets the specification of the International Rugby Board for tensile strength performance for artificial grass sports surfaces. The previous artificial pitch was only three-and-a-half years old and had served the Club well – in fact Saracens had won the Aviva Premiership twice and both the European Championship Cup and the LV Cup once, since it was installed. In view of the fact that the existing pitch still had plenty of life left in it after around 350 matches played on it and 7,750 hours of community use, it was carefully uplifted to be used elsewhere, as part of the upgrade process.